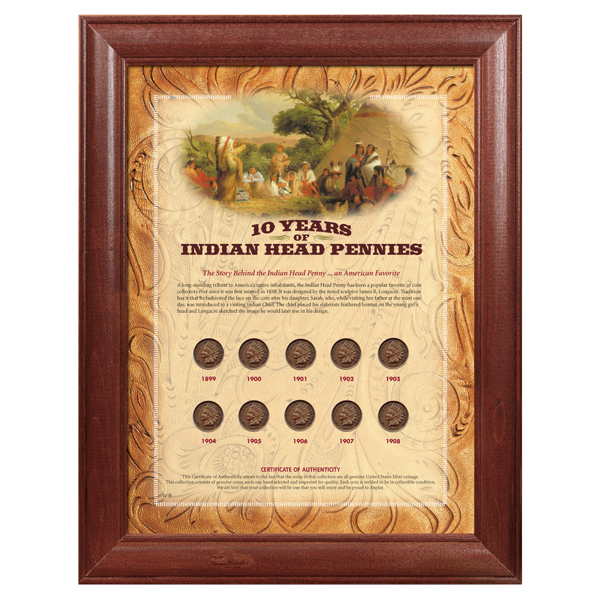 These coins are a symbol of the bygone American Frontier: 10 Indian Head Pennies, one from each year from 1899 to 1908. All are 95% Pure Copper and in wonderful condition. The coins are displayed in a rich wooden frame which includes the Indian Head Penny's illustrious history. Certificate of authenticity included. Allow 2-3 weeks, no rush delivery or gift box. Item can only be shipped within the Continental US.